Only one bracelet was awarded on Day 14 of the 2011 PokerStars World Championship of Online Poker, but it went to one of online poker's all-time greats. Steve "gboro780" Gross added yet another notch to his belt by winning his first WCOOP title in the $300 HORSE event. It was the New Jersey native's third tournament win on PokerStars since moving to Canada earlier this month to resume his poker career. The second heads-up tournament of the 2011 WCOOP attracted 765 players and generated a prize pool of $382,500. After five rounds of play on Saturday, the field was trimmed to 32, and several top pros have their eyes set on the first-place prize of $95,625. Among those who survived Day 1 were Grayson "gray31" Ramage, Andras "probirs" Nemeth, Torsten “jetkiss” Brinkmann, and Team PokerStars pro Chad "ChadBrownPRO" Brown, who is looking for his first final table of the 2011 WCOOP after bubbling Event #33. The most intriguing matchup of Round 6 pits Evan "PURPLE"K"99" Parkes against Elio "smokrokflok" Fox. Both players have more than $2 million in online earnings (Parkes has over $3.5 million) but have yet to capture WCOOP glory. Play resumed at 1000 EST (1500BST) on Sunday and will conclude when the heads-up champion is crowned. After each went three bets on third street, "Kaas81" was all-in on fourth street with a wheel draw. "CACAFOGO" also held a wheel draw, while "playitsafe" hit an ugly on fourth street. Still, that didn't deter "playitsafe" from moving forward with the hand, spiking a on fifth street. At this point, "Kaas81" made an 8-5 low, but failed to improve from there. "CACAFOGO", meanwhile, got it all-in on sixth street, but was only able to make a 10-5 low. That left the door open for "playitsafe" who made a 7-6 low on seventh street to not only knock both players out, but also to claim the chip lead. Kyle "KJulius10" Julius exited two games later in stud hi/lo. Short stacked, Julius committed the last of his chips with / against "ViTaMin_F22's" / . Julius caught a mediocre on sixth street and the on seventh street to make just a pair of sevens with no low. "ViTaMin_F22," meanwhile, made a low on sixth with the and caught a straight on seventh with the to secure the entire pot and eliminate Julius in sixth place. Departing next in Omaha hi/lo was "bisbiki78." 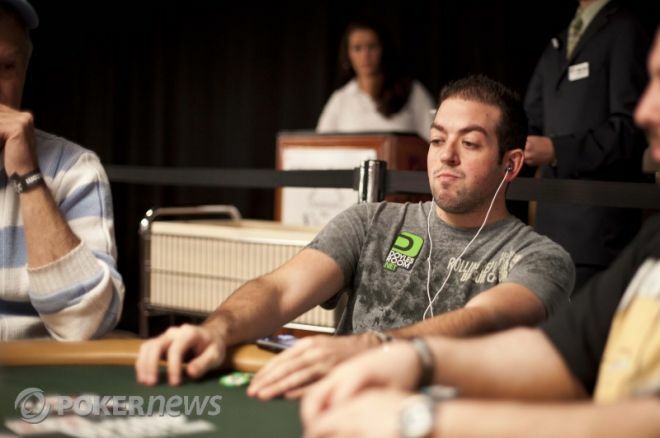 After an flop, "bisbiki78" was all-in with against Steve Gross' . The turn was great for Gross and gave him many more outs to a straights and a flush. He got there when the hit the river to take down the pot. Alex "joiso" Kostritsyn busted during the stud round, also against Steve Gross. Kostritsyn committed his stack with / against the / of Gross. On fifth street, Gross improved to trips but Kostritsyn wasn't able to improve his hand past ace-high and hit the rail in fourth place. Out of the remaining three, "playitsafe" failed to make it to heads-up play. In Omaha hi/lo, "playitsafe" defended a button-raise by "ViTaMin_F22" from the big blind. The flop came down and "playitsafe" put in a check-raise, that was called. The rest of the chips went into the middle when the hit the turn and "playitsafe" showed for a flopped full house. However, "ViTaMin_F22" turned aces full with and added insult to injury by hitting the on the river for quads. Gross made quick work of "ViTaMin_F22." He needed only seven hands to lock up his first WCOOP bracelet. The final hand came in razz, and here is how their respective hands looked at deal's end. Gross' third-street completion and fourth-street bet were called by "ViTaMin_F22." When fifth street fell, Gross bet once again, but this time his opponent raised. Gross called and the rest of his opponent's chips went into the pot on sixth street. "ViTaMin_F22" improved to an 8-5 low, but Gross' wheel draw made the next best thing for his hand, a winning 6-5 low. For his impressive performance, Steve "gboro780" Gross pocketed $33,332.52 and won his first WCOOP gold bracelet.